Can you believe it has been 10 years since Rick Riordan first released Percy Jackson and the Lightning Thief? Many readers are just finding it for the first time because its popularity has continued in the decade since it was first published. Even if you have a copy of the original book, this special anniversary edition would make a great addition to your collection! 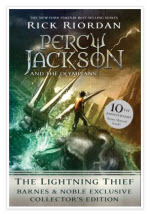 Previous post: New Percy Jackson Series in 2015!